Horizontal drilling is a technique used to develop larger oil and gas resources from a single well. Horizontal drilling and horizontal wells have been common practice in the oil and natural gas industries since the 1970s, but the US Department of Energy notes the concept was first introduced as early as 1929. In Australia, horizontal or “directional” drilling has been common since the 1990s and has been used more recently to target deep shale gas resources in South Australia and NT. Australia’s first horizontal shale gas well was drilled by Santos in SA’s Cooper Basin in 2013 and the most recent example was Origin’s Amungee NW-1H well in the Beetaloo Basin in the NT. The Amungee well was drilled in 2015 and hydraulically fractured in 2016. It resulted in an important natural shale gas discovery for the Northern Territory. These and other horizontal wells have been drilled safely with no impact on water resources or the environment. Larger wells do of course use more water, sand and other additives, but the technology means fewer wells are drilled overall and the environmental impact is thus reduced. Today, companies can drill multiple horizontal well paths from a single surface location. Clustering wells onto a single surface location dramatically reduces the overall amount of surface land required for wells and related infrastructure. Reducing oil and gas wells’ surface impacts while also improving production is an important advantage of horizontal drilling. Also called deviated drilling, directional drilling involves deliberately shifting a well’s path from the vertical. Wells can be deviated until they are running horizontally. They can even be steered – in real time – upwards or downwards once the horizontal direction is established. Enhancing oil and gas production by drilling in a way that exposes more of the reservoir to the wellbore. To steer the well path, rotary steerable equipment is mounted on the drill pipe just behind the drill bit. These systems are controlled from the surface to redirect the drill bit to steer the well on any desired path. Directional drilling is precise. Wells kilometres deep can be directed to within centimetres of their targets. laying water pipelines and telecommunication cables. Water produced during coal seam gas extraction can be safely re-injected hundreds of metres underground, according to new CSIRO research. This can help replenish aquifers used by farmers and communities. Producing water from coal is a common practice. The first water well was drilled into the Walloon coals in 1928, many decades before CSG technology was developed. 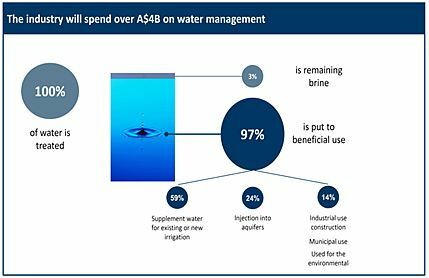 Currently 1,647 bores unrelated to the gas industry are producing 11.4 billion litres of water every year from Queensland’s Walloon coals  (the state’s main coal seam gas-producing geological formation). About 42% of this water is used for agriculture, and 53% for stock and domestic purposes. To produce natural gas from coal, the pressure must be reduced by pumping water from the coals. In our dry country, this water is an important resource that cannot be wasted. industrial purposes such as drilling, coal washing, power station cooling. All produced water is considered for beneficial use. How it is used depends on local needs and priorities. In Queensland, when a CSG company produces water from coals (including the Walloons) for beneficial use, a ‘Beneficial Use Authority’ is required from the government. There is one for irrigation  and another for other  purposes. Special Authorities  may also be used for specific projects. These Authorities specify what must be tested for and how often, as well as who should do the testing and which authority should receive the reports. For irrigation use, tests include electrical conductivity, sodium absorption ratio (for soil integrity), pH (acidity) and 16 heavy metals and metalloids. The water processing technology most commonly used by CSG operators to meet these standards is reverse osmosis. This is the same technology used to process drinking water in major cities around the world, including London, Singapore and Dubai. There is a long history of water usage from coals, and rigorous processing and testing regimes are used when CSG companies produce this water and make it available for beneficial use. We can be confident that CSG production water processed for beneficial use meets the high standards required for our agriculture industry and regional communities. One of the most recent developments in the world of high-tech offshore oil and gas operations is the introduction of marine robots. These robots can not only extend flexibility and hours of operation, but also reduce the risks associated with using divers many kilometres out to sea. One form of marine robots is underwater autonomous vehicles (UAVs), which are now being used to identify and combat biofouling – or the spread of unwanted plants or animals in the marine environment. Organisations such as CSIRO and Fastwave in Perth have appeared at recent APPEA conferences to demonstrate how UAVs can detect and neutralise marine biosecurity risks. New designs, such as CSIRO’s Starbug UAV, are small enough to be operated by one person without the need for cranes and other specialised equipment. These UAVs can be used to autonomously inspect offshore vessels and rigs to look for potential biofoulling. The UAV can take samples or use microwave, ultraviolet or other methods to neutralise threatening species. APPEA has written some more facts on biosecurity that can be accessed on our website at http://www.appea.com.au/industry-in-depth/technical-information/environment/biosecurity/ . Coal seam gas – our next renewable energy source? February 18, 2015 2:55 am Comments Off on Coal seam gas – our next renewable energy source? CSIRO scientists are investigating whether injecting coal seams with certain kinds of bacteria and carbon dioxide can produce commercially viable quantities of natural gas. Australia is blessed with large volumes of natural gas – enough to last centuries at current consumption rates. One of the biggest sources of natural gas comes from underground coal seams. This is often referred to as coal seam gas (CSG). CSG can be either biogenic or thermogenic. Biogenic natural gas occurs as a product of microorganisms under the surface of the earth, whereas thermogenic natural gas results from chemical reactions that occur without the presence of microorganisms. These decomposition reactions are instead triggered by the application of extreme heat. Most, but not all CSG is thermogenic. Researchers are now interested in the nature of biogenic CSG, and how it can be enhanced. The challenge is to find a way to encourage the microbes to produce more methane or natural gas to either replace gas reserves that have been used, or to supplement existing reserves. The CSIRO is currently developing a program on microbial enhancement of coal seam gas production. This is aimed at understanding the processes involved and finding ways to replenish depleted and unproductive coal seams. The trick is to find and supply nutrients to the right microbes, which occur naturally in the environment, to produce methane. In effect, these microbes produce methane as they grow and live, much as we produce carbon dioxide when we breath. These ‘bugs’ can feed on carbon dioxide , converting it to usable methane, and on buried coals or special food injected underground to stimulate the gas production. These processes are already going on naturally, and scientists are looking for ways to exploit this activity. The result could be an important new source of renewable energy. CSG: potentially the next renewable energy source! THIS year the Australian oil and gas company Santos began searching for shale gas in the rocks beneath Tanumbirini, a remote cattle station in Australia’s Northern Territory, 600 kilometres south-east of Darwin. Engineers drilled 4000 metres through an entire layer of shale rock, looking for evidence that it contains natural gas and making this one of the deepest exploratory wells on the continent. At the same time, other companies are eyeing the next generation of offshore gas reserves. These will come from ultra-deep wells stretching 1500 metres or more beneath the ocean floor. These reservoirs are the last frontier for hydrocarbon discovery. They’re not particularly hard to find: the challenge is to work out what they contain, how much can be extracted and at what cost. The sheer dimensions and depth of these fields make this time-consuming and expensive. But it is the geological complexity of the rock that makes these reservoirs so hard to characterise and this kind of exploration so financially risky. That’s why a new generation of engineers is developing techniques that can characterise these regions in greater detail than ever before. The ultimate goal is to develop three-dimensional computer models of vast regions of gas-bearing rock that reveal not only how much gas is trapped but also the geological and chemical environment in which it sits, and even how this will change over time as the reserve is tapped. For a conventional gas field, it is relatively straightforward to work out how much gas can be extracted because the gas is free to flow but usually trapped beneath an impermeable layer, like a bubble. Most of this can be extracted by drilling through the impermeable rock, allowing the gas to flow up and out. But so-called unconventional resources such as shale gas and coal seam gas are much harder to characterise because the gas cannot flow easily through these rocks. The amount that can be extracted depends on the network of natural cracks in the rock, how easily it can be fractured to produce more cracks and hence release more gas, whether the gas is chemically bound to the rock and so on. Then there is the type of rock, the shape of the formation, how easy it is to drill into – the list goes on. Oil and gas companies typically characterise resources through a combination of exploratory drilling and sophisticated computer models. They create these models by first mapping promising sections of geological basins – on land or underwater – by transmitting seismic waves into the ground and measuring the way they are reflected and bent by deep geological features. One long-standing problem for these kinds of surveys are vast layers of salt deep underground that tend to blur seismic waves, making it hard to probe what lies beneath. Salt is impermeable to oil and gas so important resources can be trapped beneath this layer. To get around this problem, engineers have developed mapping techniques capable of looking beneath the salt. BP’s Wide-Azimuth Towed Streamer system represents the state-of-the-art for creating 3D seismic images. WATS uses several ships sending acoustic waves into the water from different positions. These are flanked by other boats towing long floating cables carrying hydrophones to record the echoes. These cables can be several kilometres apart (see diagram). This distance ensures that the hydrophones receive the same rebounding seismic waves from a variety of angles. This provides a 3D perspective that can reveal what lies beneath salt layers. These surveys are also getting faster thanks to new techniques that reduce noise and filter out unwanted reflections. This allows engineers to use natural seismic waves generated by the Earth itself. And a new generation of sensing techniques use a single optical fibre to sense the reflected seismic waves along its entire length. This allows large areas to be monitored continuously for long periods of time. “The cost of seismic acquisition drops to almost nothing,” says geophysicist Roman Pevzner at Curtin University in Perth, Australia. Such long-term monitoring can be useful for tracking which parts of a reservoir are being exhausted and which should be drilled next. Seismic data is just the start, however. 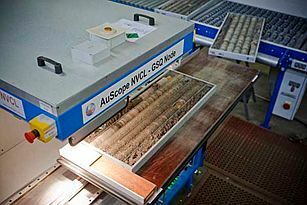 It can also be combined with electromagnetic surveys – which can distinguish between brine, which acts as a conductor, and gas, which has a higher resistance – and gravity measurements from satellites, which reveal different densities in the layers of rock below the ground, to give a more complete picture without resorting to expensive exploratory drilling. “Once we have sufficient confidence from the seismic and geological interpretation that there is a reasonable prospect of finding gas, we may choose to drill an exploration well,” says Shaun Gregory, senior vice-president of sustainability and technology for Woodside, Australia’s largest oil and gas company, based in Perth. Drilling is still the only way to be certain that gas is present. It also produces samples that reveal the pore structure of the rock in the formation. These can all be combined, along with mapping data, to create a computer model of the potential reservoir to gain insight into where the “sweet spots” to drill production wells might be. The explosion of computing capacity is making these models cheaper and more accurate, says Bill Barkhouse at the Society of Exploration Geophysicists (SEG) in Houston, Texas, which is pioneering these methods. The goal is to combine data about the rock at many different scales, from the molecular dynamics of how gas adheres to a substrate, to how gas flows through different types of rock, all the way to the behaviour of an entire gas field. “We are able to look at every level,” says George Moridis, head of the Hydrocarbon Resources Program at the Lawrence Berkeley National Laboratory in California. One such advanced model is currently being developed by the SEG with companies such as Chevron and Royal Dutch Shell. 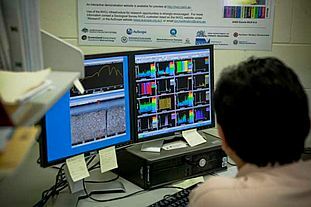 Called SEAM (SEG Advanced Modeling Program), the project has four phases, the first of which modelled a chunk of the sea floor 40 kilometres by 35 kilometres in the Gulf of Mexico to a depth of 15 kilometres, with a resolution of just 10 metres. The SEAM team has now turned its attention to land-based models of gas reservoirs that have been hydraulically fractured to work out how hydrocarbons flow through these rocks. The team also wants to predict the pressure at different points in a formation, an important factor in drilling operations. The ultimate goal is to simulate the entire life of a gas field as the hydrocarbons are extracted. But despite the huge advances made in gathering data and analysing it, Barkhouse says these models are too expensive and time-consuming to be commercially useful at this point. The SEAM phase I cost over $5 million and took 24 experts six years to create, finishing in July 2013. By contrast, a land-based exploratory well costs around $1 million and produces results on a timescale of weeks rather than years. Exploratory marine wells are much more expensive and can cost upwards of $100 million to drill. 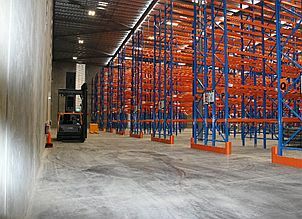 But again, they produce quicker results, a key factor in a fast-moving industry. Nevertheless, engineers are increasingly turning to supercomputers to analyse the flood of data their surveys are generating. BP’s Center for High-Performance Computing in Houston houses a machine capable of more than 2 quadrillion calculations per second (2.2 petaflops) for analysing the data from WATS and other sources. Computer scientists there are developing machine-learning algorithms that comb the data for “promising anomalies”. Gregory says the future of this technology is clear. Sensors will continue to get smaller, cheaper and less power-hungry, and they will feed ever growing amounts of data into increasingly powerful computers. He envisions networks of nanoscale sensors that can be injected into a well, giving a detailed picture of its structure and behaviour.